I've always loved the idea of pampering days. I remember going to the drugstore and picking out a tube of fluorescent green face mask. I'd put some Top 40 on my boombox, pull my hair back with a scrunchy and spread the green goop all over my face. In 15 minutes, the mask would be hard and my face would feel like it had every. single. drop of moisture sucked out of it. I would spend the rest of the day intermittently filling my cheeks with air to stretch out my skin and get rid of that annoying tight feeling. Yet I was still somehow convinced this was the price for long term beauty. Fast forward a dozen years. I can now afford more than a $4 tube of glowing goop, but still can't justify $100 bucks for a spa treatment. My current version of a mini pampering session is bathtub + book + chocolate + candle + Hosie Clay Mask + no little fingers wiggling under the bathroom door. It works for me. What I love about the Hosie mask is that I kind of forget about it while it's doing its thing. I don't cringe as it hardens because my skin feels so tight and itchy that I can't stand it. After I rinse it off, my face looks noticeably improved. 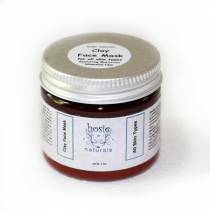 The Hosie clay mask has three simple, balanced ingredients that work together to unblock pores, improve skin's elasticity and balance oil production without drying. It's gentle enough for sensitive or acne-prone skin. For a truly skin pampering experience, put a thin layer of face serum on underneath the mask. This will draw impurities out while driving the repairing face serum deeper into the skin. If you haven't already, enter our Mother's Day giveaway to win a basketful of stuff for your own mini pampering day! Includes Hosie Naturals Clay Mask, the rest of our skin care line and a few other goodies. As a teenager, I was easy prey for any product that marketed beautiful, radiant skin. I'd beg my mom for any new skin care product that promised to make my acne vanish, my skin glow and my confidence soar. Not all of those were cheap either (sorry, Mom). I wound up with a cabinet full of half empty bottles and the same old face staring back at me in the mirror. When I discovered real food and started ditching my chemical-laden facial products, my major cystic acne problem did disappear. Alleluia. When I started oil cleansing, I saw a great improvement in my skin. Those occasional breakouts almost completely ceased. My skin stopped oscillating between overly oily and dry and tight and finally just relaxed in a beautiful place in between. I started wearing makeup only occasionally to enhance and not to cover up. I thought when the acne cleared, my skin would look flawless. But I found myself feeling dissatisfied Now that I no longer had to focus on my blemishes, I got to see the up close and personal damage a few decades can do to one's skin. Toxins from all of my skin care experiments. As thrilled as I was that the acne was gone, I was less than satisfied with the dull, pock-marked face I was left with. I overheard talk about fine lines and wrinkles from ladies just a mere generation ahead of me and thought I should just enjoy this semi-happy middle stage without acne or wrinkles. But I can feel that fine-lined future creeping up on my face. I'm getting a wicked little pair of lines forming between my brows that DON'T GO AWAY when I stop furrowing my brows in concentration. I suspect their formation began during college statistics class. 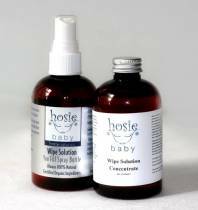 Baby wipes. In my head, it makes sense that they should contain the gentlest ingredients on the planet since I’m rubbing them all over my baby’s perfect bottom. And sometimes her hands and face if peanut butter was involved.